The new fashion statement in Beijing this week is face masks—and not because of the flu epidemic. In fact, schoolchildren in China’s capital city were ordered to halt all outdoor sports and activities today, as a filthy cloud of smog continued to shroud the People’s Republic, reducing visibility and posing a dangerous health hazard. The air pollution level this morning reached 251 on a scale of 300 in Beijing—and even higher, 278, in Shanghai. 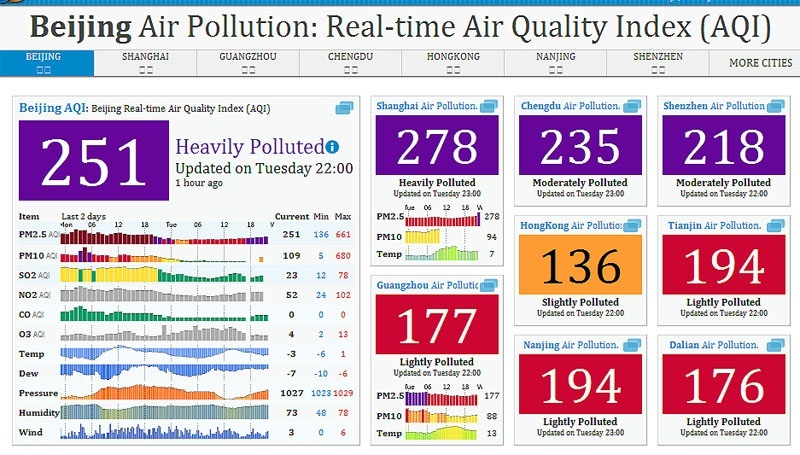 While 51-100 on the Air Pollution Index Scale is “good,” with no health implications, the air quality in China today is so poor that even healthy people will be noticeably affected; and will have trouble breathing and walking outside. Air quality was even worse over the past weekend. Emergency response measures were adopted in Beijing when the city's air quality reached a level of 755, regarded as "beyond index." For the first time, Beijing activated a new plan restricting construction and industrial activity, curbing vehicle use by government officials and ordering schools to limit outside activity, said state-run Xinhua news agency. Beijing Hyundai Motor Company suspended production on Sunday, and nearly 30 construction sites halted work, the China Daily cited the city's environmental protection bureau said. For some time, China's government has acknowledged, and announced intentions to address, its air quality problems, which have been attributed to a legacy of more than three decades of unfettered economic growth. New Communist Party leader Xi Jinping tackled the issue directly when he took his post last November, citing a "better environment" as a major goal in a national address. Last month, the environmental ministry specifically mentioned for the first time its aim to reduce levels of PM2.5—tiny particulate matter—by five percent each year in major cities and industrial areas through 2015. According to The Wall Street Journal, China's National Development and Reform Commission, the country's top economic planning body, said it expanded a pilot program nationwide that offers subsidies to coal-fired power plants that reduce nitrogen-oxide emissions. Last year, heavy haze and smog forced the cancellation of nearly 700 flights at Beijing airports. The city is comparable to Los Angeles, another smoggy city, according to experts. State media predict that things will, literally, lighten up on Wednesday, when a current of fresh air will arrive and blow the dark smog away.